Шалахов Е. Г. Ust-Vetluga Burial Ground: Seyma-Turbino Culture Type Flint Implements // Молодой ученый.  2014.  №1.  С. 313-315.  URL https://moluch.ru/archive/60/8678/ (дата обращения: 22.04.2019). Ust-Vetluga (Urino, Ust-Vetluga) ground Bronze Age burial ground was excavated by the paper author during archeological surveys in the neighbor of Sutyry, a Russian non-existent village, in the fall of 2000 [1, p. 8; 2, pp. 91–92; 3, p. 188; 4, p. 230]. The necropolis is located 4 km to the East from Urino village, a regional center of Mari El Republic, 350 m northwest from the existed mouth of the Vetluga River; on the dunes of the left bank of Cheboksary reservoir (see Fig. 1). The funerary monument was excavated by B. S. Solovyev in 2001–2006 (Mari expedition). Bronze weapons such as spearheads, knives, socketed celts that belonged to the soldiers of ancient Siberian and Altai tribal groups migrating to Eastern Europe were found in the graves [5, pp. 103–109; 6, pp. 168–174]. Ust-Vetluga funerary complexes dated back to 19– 17 centuries BC [7, p. 112]. Fig. 1. Eastern Europe and adjacent territories, Ust-Vetluga is marked. Almost all the metal items discovered in the excavation site and graves destroyed by the Cheboksary reservoir were described in detail and analyzed by B. S. Solovyev [2, pp. 92–93; 5, pp. 110–111; 8, pp. 57–61]. The situation concerning flint implements of Ust-Vetluga burial ground is different. Approximately a half of this collection has been introduced for scientific use [2, Fig. 1, 13; 3, Fig. 2, 1–4; 5, Fig. 5, 1–7, 10, 11; 6, 6, 7; 8, Fig. 5, 3; 9, Fig. 1, 1–3]. The present paper precedes the oncoming full publication of missiles collected in 2000–2008 on the site of eroded graves of Ust-Vetluga burial grounds. Ust-Vetluga flintlock armament is presented by some types of arrowheads varying in header or petiole designs. The 1st type (Fig. 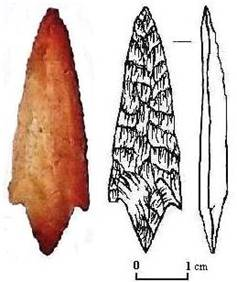 2, 2) comprises arrowheads of triangular or sub-triangular shape having straight-cut base (22 pcs found). These items are similar in every way with the items of funerary complexes of Turbino I, Seyma and Reshensky burial grounds [10, Fig. 90; 11, Fig. 60, 4–7; 12, Fig. 1, 2–7]. O. N. Bader called them “Turbino” items [10, p. 97]. 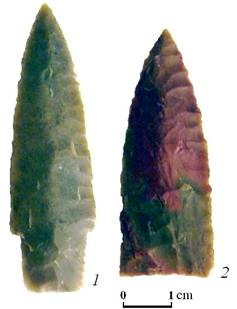 The 2nd type comprises arrowheads of triangular shape with concave base (2 pcs in total), that are slightly similar to flint arrows of Seyma-Turbino type Bor-Lenva burial ground [13, Fig. 3, 6, 8]. The 3rd type of flint arrowheads of Ust-Vetluga necropolis is of great interest (Fig. 2, 1). They are big arrowheads with a spread triangular tip and wide sub-triangular petiole (2 pcs). Their analogues were discovered in Reshensky graves where they were found in bulk [14, Fig. 104, 8–11]. Fig. 2. Ust-Vetluga: flint arrowheads (author’s findings, 2006). The 4th type of Ust-Vetluga flint arrows comprises heads with spread and triangular tips, short triangular petiole and stings (Fig. 3). According to O. N. Bader’s opinion these 2nd type Seyma arrows “could be called Seyma type” [11, p. 121]. Actually, the finding of 2004 is quite similar to Seyma burial ground stuff by its proportions and wide flat surface processing technique [11, Fig. 60, 1, 2]. Fig. 3. Ust-Vetluga: stone arrowhead (archeological finding, 2004). Quite big high quality flinty slices of different cuts were used as dies of Ust-Vetluga heads. Flint was probably of bouldery origin. Most of the heads were treated with precise planar retouching on both sides of an item. Some items of the flint arrows have strongly cut lengthwise edge most likely to increase breakdown power of arm. The examined set of flint items of Ust-Vetluga graves clearly proves the hypothesis of scientists of Seyma-Turbino transcultural phenomenon about offensive nature of “social communities” (populations) of migrating soldiers of the Bronze Age who “played a great part” in creating Eurasia metallurgic province system [14, p. 271; 15, p. 75, 86]. 1. Shalakhov E. G. Study for Urino archeological sites in 2000–2001 // Urino regional digest (proceedings of regional conferences of 2002 and 2004). Urino: Urinsky rabochi, 2004. — pp. 7–8. 2. Solovyev B. S. Seyma-Turbino age findings in the Mari Volga region // Relics of the Volga and Kama regions. / Archeology and ethnography of the Mari regions. Issue 25. / — Ioshkar Ola: Mari Scientific and Research Institute, 2001. — pp. 90–96. 3. Solovyev B. S. On the Abashevo component of Urino burial ground // Abashevo cultural and historical region: sources, evolution, inheritance. Proceedings of International scientific conference. — Cheboksary: Chuvashia State Arts Institute (CGIGN), 2003. — pp. 188–192. 4. Nikitin V. V. Archeological map of the Mari El Republic. — Ioshkar Ola: Mari publishing house, 2009. — 416 p.
5. Solovyev B. S. Urino (Ust-Vetluga) burial ground (excavations outputs of 2001–2004) // Rossiyskaya archeologia. — 2005. — # 4. — pp. 103–111. 6. Solovyev B. S., Shalakhov E. G. Soldiers burial of Urino burial ground // Researches on ancient and Middle Age archeology of the Volga region. — Cheboksary: CGIGN, 2006. — pp. 168–174. 7. Yungner H., Karpelan K. On radiocarbon milestones of Ust-Vetluga burial ground // Rossiyskaya archeologia. — 2005. — # 4. — p. 112. 8. Solovyev B. S. Urino (Ust-Vetluga) burial ground (of 2001) // New archeological studies in the Volga region. — Cheboksary: CGIGN, 2003. — pp. 50–72. 9. Shalakhov E. G. Funerary stuff of Urino (Ust-Vetluga) Seyma-Turbino type burial ground: flint and jade // History and archeology. Proceedings of International Distance Scientific Conference (St. Petersburg, November 2012). — St. Petersburg: Renome, 2012. — pp. 75–77. 10. Bader O. N. Ancient metal-makers of the Cisurals region. — Moscow: Nauka, 1964. — 176 p.
11. Bader O. N. The Oka river basin in the Bronze Age. — Moscow: Nauka, 1970. — 176 p.
12. Bader O. N., Chernikov V. F. New Seyma type findings at Reshnoe village, Oka river // Issues of ancient and middle age Eastern Europe archeology. — Moscow: Nauka, 1978. — pp. 130–132. 13. Denisov V. P., Kuzminykh S. V., Chernykh E. N. Seyma-Turbino type burial grounds in the Volga-Kama region // Monuments of primitive age in the Volga-Kama region. — Kazan: Institute of language, literature and history n. a. G. Ibragimov of Kazan Subsidiary of Academy of Science of the USSR, 1988. — pp. 46–69. 14. 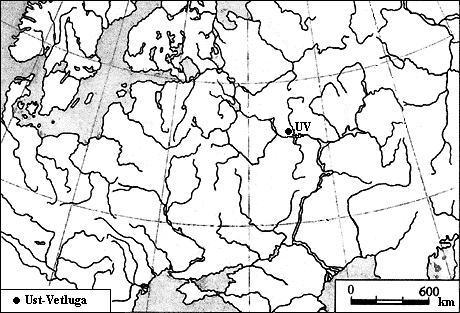 Chernykh E. N., Kuzminykh S. V. Ancient metallurgy of the Northern Eurasia (Seyma-Turbino phenomenon). — Moscow: Nauka, 1989. — 320 p.
15. Chernykh E. N. KARGALY, vol. V: Kargaly: evolution phenomenon and paradox; Kargaly in the metallurgy province system; Hidden (sacred) life of archaic miners and metal-makers. — Moscow: Slavonian culture languages, 2007. — 200 p.
Основные термины (генерируются автоматически): CGIGN, KARGALY, USSR. (В. В. Каргалов считал войска по количеству Чингизидов, участвовавших в походе, а Э. Хара-Даван анализировал труд генерала М. И. Иванина). Пристальное внимание собственно процессу монголо-татарского нашествия на Русь уделили в своих работах И. Б. Греков с Ф. Ф. Шахмагоновым и В. В. Каргалов.